The Universe is not only stranger than you think; it’s stranger than you can imagine. The nest contains three chicks. A closer view is below. 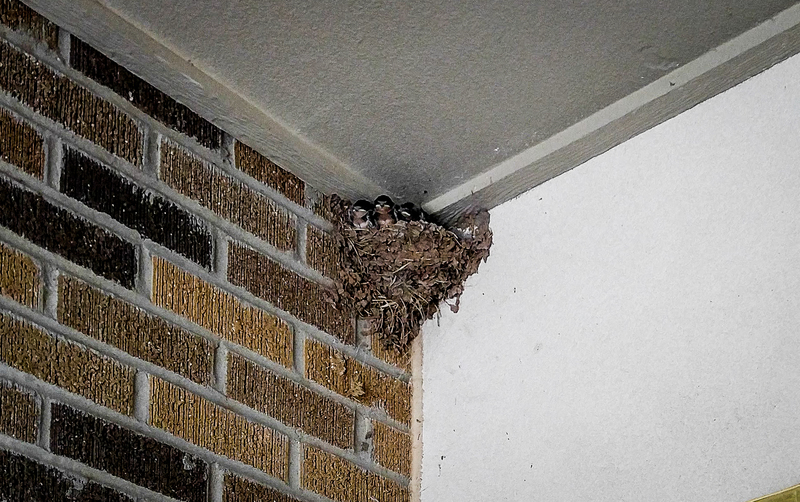 As far as I can tell, the nest was built in April, the eggs laid in May, and hatched in June. You can readily, imagine that the effluvia from all this reproductive activity results in a big mess on the walkway beneath the nest. 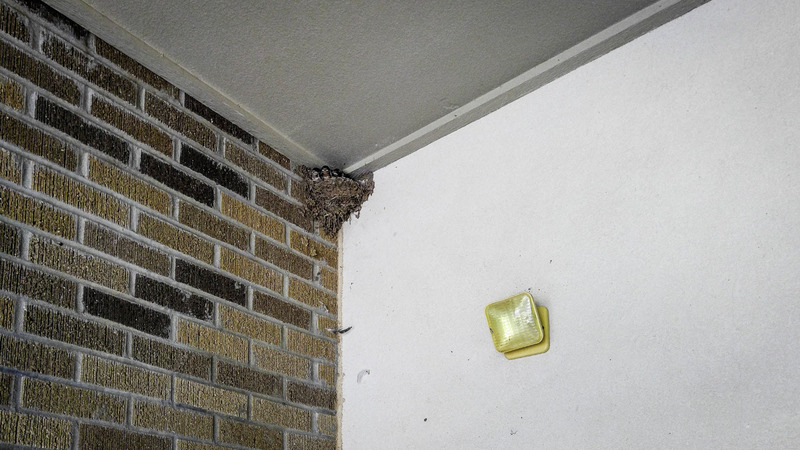 It does, but the building’s maintenance crew is understanding and leaves the site untouched until the chicks fledge and the nest is abandoned. Then they will take it down and completely clean the area. Come Spring, the avian couple will return, build a new nest virtually identical to the previous ones, and the entire process will repeat. How do they know what to do? Nobody taught them to build a nest that’s fastened as high as possible and yet is not close enough to the ceiling to prevent their chicks from raising their heads to receive food as they grow and also to allow the parents entry to the site. The nest is a marvel of practical engineering. Built in a little more than a week by two birds not much more than four inches from beak to tail, it consists of nothing more than mud and twigs. Yet it is the right size for its occupants and of sufficient strength to bear the increasing weight that the growing young will add to its load. This behavior is obviously programmed into these birdbrains. They are born knowing all that’s necessary for them to reproduce. You can study GTA and C (the genetic code for those of you who majored in English) all your life and you still won’t understand how this code precisely causes these animals to act as they do. You can likewise examine all the amino acids they encode for eons without solving the seemingly miraculous feat they perform without instruction year after year. Innumerable instances of the programmed cycle of life surround us to such depth that we barely give them a thought. Yet despite enormous increases in our understanding of biology, the process appears more magical with the appearance of every new scientific observation. Year after year science provides more answers to problems, some of which were not even imagined a short time ago, yet each bit of knowledge raise scores or hundreds of new questions. While our knowledge increases arithmetically, the things we now realize we don’t know grow exponentially. Thus, we become more ignorant every day. You’d think that this increase in ignorance would prompt ever more humility about the key questions of existence. But the opposite seems the rule. There are three basic questions central to existence. How did the universe start? How did life begin? When and how did human consciousness emerge? Human beings are programmed to ask these questions to the same degree that the birds above are driven to build their nest and raise their young. When there was no real evidence that could approach an answer to them, we made up stories that we took as gospel. They left nothing out. We had complete answers. And thus we lived in the absence of ignorance. The rise and sway of science gradually provided ever increasing clues to all three. But the more we learned the greater the uncertainty as to what was really going on. Indeed, uncertainty appears to be a basic property of physics. We think the universe began about 13.8 billion years ago in a big bang. The name was first used derisively to describe the theory that now has the term indelibly attached to it. Each year new questions about the real nature of this Big Bang arise with at best ambiguous answers. The universe is believed to have expand by a factor of 1078 in the first 10−32 of a second after the Big Bang. Think about these numbers; they defy analysis and comprehension to anyone not submerged in advanced mathematics and physics. The universe has continued, so cosmologists believe, to expand at variable rates up to today. The current condition of the universe requires the presence of both dark energy and matter. Do they really exist or are they fudge factors needed to satisfy incomplete theories? Time itself used to be pretty straightforward. Now it’s very hard to define. We know that it is not constant, but variable depending on the state of the observer. Whole books are written to explain what it is. Time was thought to have started with the Big Bang. Currently it’s thought possible that there might have been events before the Big Bang. The body of our ignorance seems to expand faster than the universe. I don’t know much about either physics or mathematics, so let’s go to life. I do know a little of biology. When Darwin (along with Wallace) proposed the theory of evolution he had two questions he couldn’t answer. How did life start and how, when species evolved and differentiated, was heritability governed? He didn’t know that a younger contemporary already had found the answer to the second question. It took biology 40 years to realize Gregor Mendel’s momentous discovery of genetics – a discovery every bit as important as that of evolution. But we are still left with the towering mystery of abiogenesis – a fancy way of saying the origin of life. Life on earth started at least 3.5 billion years ago and perhaps a lot earlier than that. The earth itself is about 4.5 billion years old. As far as we know, life exists nowhere else in the universe. That’s a concept hard to wrap your brain around. Anyway, once life has started it’s not hard to come up with theories explaining how to get from a one celled organism to us – the wise ape. Then a new problem arises, one of equal complexity to the start of the universe and that of life – see below. But there is not just one settled theory of evolution that takes us from bacterium to man, there are many of dizzying complexity, but they are simple compared to getting life going. Examine any explanation of how life began and you will be deluged with so much speculative information that your exit from this universe of theories will leave you far more confused than when you first began your study of abiogenesis. In short, while we’re the opposite of clueless, we have so many theories, none of which is definitive, that we are functionally ignorant as to how the animate emerged from the primordial ooze – if we came from an ooze. Regardless of how, life had started and (escaping a myriad of catastrophes which could have extinguished it) 3.5 billion years later we came along. About 200 thousand years ago anatomically modern humans emerged in east Africa. Were they functionally like us? I mean did they engage in abstract thought. We’ll never know for sure, but I suspect they didn’t. Somewhere between 50 and 10 thousand years ago human consciousness emerged. How and why remains a mystery. Language, art, the pyramids, music, organized warfare, religion, mathematics, the wheel, agriculture, and science are all its children. An important digression. Suppose that there are four human generations per century. Thus 40 per milenium and 8000 since we evolved as a distinct species. Each of us has two parents, four grandparents, eight great grandparents, and so on. Eight thousand doublings give a number vastly larger than all the elemental particles in the universe – a number beyond comprehension. This calculation requires that we share the same ancestors. Consequently all humans are closely related. We don’t need a geneticist to tell us this, simple arithmetic does the trick. Back to the meaning of life and our place in the cosmos. What got an ape to start asking these unanswerable questions and in the process invent civilization? Put another way, how did we get so smart that we got to the point where we know almost nothing? In comparison to what they need to know my nest building birds know everything, while we are mired in ignorance. When you get to the kernel of existence, so vast is our ignorance that the Genesis story seems to work as well as anything else. Except that the Genesis story is the one answer for which there isn’t a kernel of evidence. A disappointing conclusion to an otherwise interesting post.